I thought this should certainly go near the top of my list for must haves on the layout. There seemed to be so many different ready built station buildings (and add-ons) by so many different manufacturers. And, if I really wanted to push the boat out, I could build my own. I am not one for cutting corners unnecessarily, but you really can’t go wrong with some stations buildings built by Hornby and Bachmann. I originally decided to go for In the end I chose to go for the Market Hampton station buildings but, after receiving a few items through ebay, I decided that I would probably use them more on the branchline. 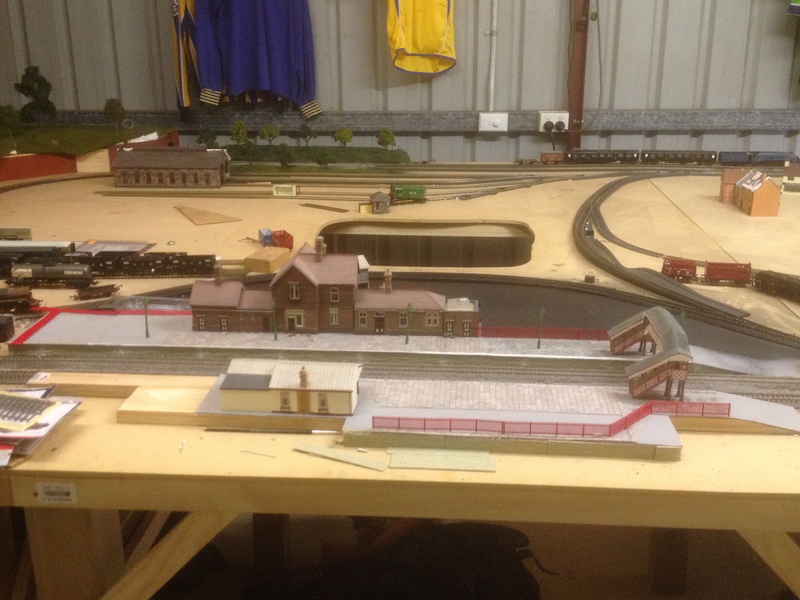 They are tidy items, but not quite as large or grand as the Sheffield Park / Bluebell station railway. 44-087: Waiting Room (opposite platform to main station buildings). 44-089: Station Canopy – not yet, but keeping my eyes out for one. 44-090: Waiting Room (main station buildings). 44-092: Signal Cabin – trying to pick one up from ebay. 44-093: Footbridge – decided to not go with this one and went with a different footbridge. There is even space on the platform to possibly put a second footbridge. I am certainly happy with what I bought (station-wise) so far. However, I was less than impressed with some of the platform options. Accordingly, I tried my hand at constructing my own with a few cut to size lengths of timber from Bunnings. This provided the stability and formed the main frame of the platform for the top to sit on. To cover up the bland wood I have used some brick sheeting and plan to do a light paint over the brickwork. I also need to think about how to cover up the joints in the brick sheeting – downpipes, fauna…? The top was simply constructed from some thick card (supplied by a local art shop) and sprayed with a matt grey aerosol. I then topped it off with a combination of some fine grey ballast and Metcalfe paving slabs. The paving slabs are time consuming but add a nice touch if I do say so myself. The jury is still out on the ballasting, so I’d definitely be open to receiving comments on this section. Installed a nice footbridge and thinking about adding a second one at the other end of the platform. Is this a bit of overkill, or something that would have occurred in real life? Plastic fencing sprayed red. I intend applying some signs, posters etc in line with my LNER theme. Sankey Scenics perhaps? 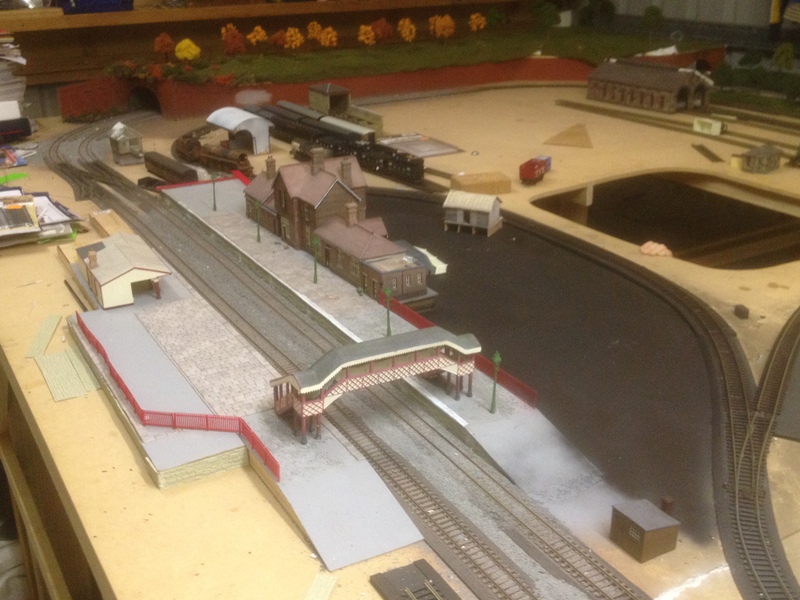 I have also chosen to go just that one step further and added to fantastic station lighting by DCC Concepts. I have “plumbed” them in, and am yet to power them up. If they look the business, then I am going to be lighting the second platform, and most likely the good yard (with different lighting, again by DCC Concepts). Ah, the goods yard. That’s gonna cost me when I get around to it. At this stage, the back of the station is looking like being a bit of a parking space. I have undercoasted with matt black, and am contemplating my options for finishing off that area. Perhaps some cobbled stones and classic brick fencing? Options, options, it’s better to have them than not I guess. Anyway, station still under construction and the design of some areas have still not been finalised, so happy to take advice.